Requirements were REVISED effective January 1, 2017. Give the history of one American Indian tribe, group or nation that lives or has lived near you. Visit it, if possible. Tell about traditional dwellings, way of life, tribal government, religious beliefs, family and clan relationships, language, clothing styles, arts and crafts, food preparation, means of getting around, games, customs in warfare, where members of the group now live, and how they live. Do TWO of the following. Focus on a specific group or tribe. Make an item of clothing worn by members of the tribe. Make and decorate three items used by the tribe, as approved by your counselor. Make an authentic model of a dwelling used by an Indian tribe, group, or nation. Visit a museum to see Indian artifacts. Discuss them with your counselor. Identify at least 10 artifacts by tribe or nation, their shape, size, and use. Learn three games played by a group or tribe. Teach and lead one game with a Scout group. Learn and show how a tribe traditionally cooked or prepared food. Make three food items. Give a demonstration showing how a specific Indian group traditionally hunted, fished, or trapped. Write or briefly describe how life would have been different for the European settlers if there had been no native Americans to meet them when they came to this continent. Sing two songs in an Indian language. Explain their meanings. Learn in an Indian language at least 25 common terms and their meaning. Show 25 signs in Indian sign language. Include those that will help you ask for water, for food, and where the path or road leads. Learn an Indian story of up to 300 words (or several shorter stories adding up to no more than 300 words). Tell the story or stories at a Scout gathering or campfire. 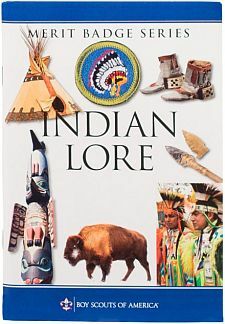 Write or tell about eight things adopted by others from American Indians. Learn 25 Indian place names. Tell their origins and meanings. Name five well-known American Indian leaders, either from the past or people of today. Give their tribes or nations. Describe what they did or do now that makes them notable. Learn about the Iroquois Confederacy, including how and why it was formed. Tell about its governing system. Describe some of the similarities and differences between the governments of the United States and of the Six Nations (the Haudenosaunee or Iroquois Confederacy).